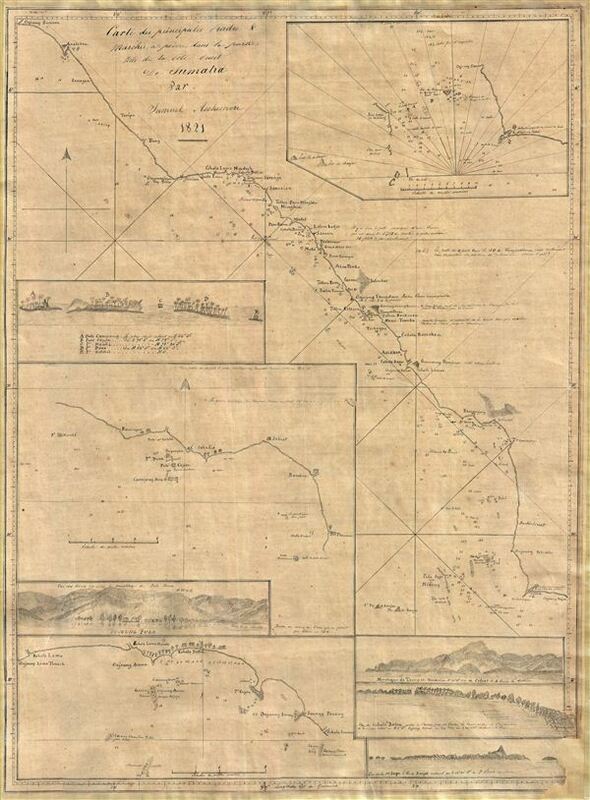 A hand drawn manuscript map - most likely the first accurate nautical chart of west Sumatra's Pepper Coast. Cartes de principales Rades and Marchés à poivre dans la partie Nord de la Cote Ouest De Sumatra Par Samuel Ashmore. Drawn by Australian-Irish sea captain Samuel Ashmore, this important and one of a kind 1821 manuscript (hand drawn) nautical chart or maritime map is the first accurate depiction of the pepper ports of northwestern Sumatra, modern day Aceh. The map covers the coast of Sumatra roughly from the pepper port of Analabou (Arongan Lambalek) to Singkil, a region often referred to as the 'Pepper Coast.' The chart features three inset maps and four inset coastal views. The largest of these, center right, focus on the area around the island harbor of Touroumang (Troumon), the largest exporter of pepper in the region and Pulo Doua (Dooa Harbour), which Horsburgh considerers 'the best among the Northern pepper Ports.' A second inset, in the upper right quadrant, details the dangerous reef-ridden passage between Singkil and Pulo Sago (Banyak Islands). A third inset, in the lower left quadrant, focuses on the pepper rich coast to the east of Cape Felix, including Kohala Batou (Kuala Batu) - a particularly hostile pepper port and site of American military activity in 1831. This region became exceptionally important with the breakout of the Padri War in 1803. The Padri War, fought between local chieftains of northwestern Sumatra following Adat law and Muslim clerics who, inspired by Wahabism after returning from Hajj, sought to convert the region to Sharia, or traditional Islamic law. Meanwhile, the colonial powers of the region, england and Holland, had tentatively agreed to dual spheres of influence, with england controlling Singapore, and the Dutch dominating Java and Sumatra. Dutch hegemony in Sumatra was nominal at best, being largely confined to the eastern portions of the island facing regional capital at Malacca (Melaka) located just across the Malacca Strait. The Padri War further frustrated Dutch attempts to control the island and its important pepper trade. At the same time, the lack of Dutch oversight opened the pepper ports of northwestern Sumatra, most of which are noted here, to foreign trade. Merchants from Australia, India, and the United States were thus able to circumvent the Dutch monopoly on pepper by trading directly with Sumatran producers. Ashmore, a merchant captain operating out of Sydney was among the first to accurately map this important stretch of coast - this is his original manuscript. This map was later integrated into the important large scale nautical charts of this region compiled and published by James Horsburgh, with whom Ashmore was acquainted. even with Ashmore's excellent nautical chart, the pepper trade was dangerous. The Padri War, while hardly disrupting the pepper supply, displaced part of the local population and led to a spike in piracy all along the coast. Moreover, the powerful British and Dutch navies were actively discouraging any trade that disrupted their lucrative pepper monopoly. Nonetheless, Australians out of Sydney and Americans out of Salem swarmed to western Sumatra - some acquired great wealth though others suffered a more grisly fate. Just 10 years after this map was drawn, in 1831, an American pepper merchant ship, the Friendship, was stormed and its crew killed by Muslim villagers living in Kuala Batu (inset no. 3). The American president, Andrew Jackson, sent 300 marines and the frigate Potomac to 'chastise' the locals. Nearly 150 Malay pirates/villagers were killed. More recently this coast was devastated by the 2004 tsunami. Being a one of a kind manuscript there are few references to this chart, however, we did find one. An english version of this chart, entitled The Northern Pepper Ports, on the west Coast of Sumatra, by Samuel Ashmore, 1821 was recorded in 1878 in the manuscript archives of the British India Office. According to the same archive reference, James Horsburgh republished this chart in 1822, though we have been able to identify no extant examples. The fact that the map is in French is also a matter of some curiosity and we can only assume that Ashmore or an assistant must have prepared this French version for a friend. This is a once in a lifetime opportunity. After retiring from the sea, Ashmore worked in and around Sydney, Australia as a marine surveyor with the Australian General Assurance Company. His death, at 71 years, was considered to be an Australian national disaster for which all of the ships in Sydney Harbor few their flags at half-mast. Very good condition. Slight loss lower right quadrant. Backed on fine linen. A catalogue of manuscript and printed reports, field books, memoirs, maps , etc., of The Indian Surveys, deposited in the Map Room of the India Office, p. 581. Horsburgh, J. and Taylor, A. D., The India Directory, for the guidance of commanders of steamers and sailing vessels, Section V., pp. 603 - 609. Moor, J. H., Notices of the Indian Archipelago and adjacent countries: being a collection of papers relating to Borneo, Celebes, Bali, Java, Sumatra, Nias: the Philippine Islands, Sulus, Siam, Cochin China, Malayan peninsula, etc, (1837) p. 109. Travers, Thomas Otho, Journal, 1813 - 1820, (Banfield, 1960) P. 118. Raffles, Sophia (Lady), Memoir of the Live and Public Services of Sir Thomas Stamford Raffles vol 2, p. 210. British Library, India Office, IOR/X/3628/50D (inaccessible, page 581), IOR: X/3634/2/35 (page 588), IOR: X/3635/136/1 (the only coloured copy in our collections, page 593), IOR: X/3635/136/2 page 593. British Library, Map Library, Map 147.e.18 (161) 2.